I have a core, already glued down and sanded, in which there is a segment about 10 rings long that is reversed. Is there any way to deal with this in CooRecorder or CDendro? CooRecorder is written to sort your measurement points from the start point (i.e. youngest ring at index 0) and on, so there is always a nearest point and from that another nearest point thus creating the chain of points for your time series. So when you set any point on the screen it will be placed either at the end of the point sequence or in the sequence between the two most near points. The drawback of this strategy is that it prohibits a radical change in measurement direction. I think you have to measure your sample as three different series possibly named like ID01A, ID01B, ID01C like it is done when you measure three different radii from the same tree. Then you have to add these three .pos files to a new empty collection (Collections/Add to this collection command) and see that the offsets are properly set. If you have no reference this might become very tricky, though with a reference and a known end year it is not difficult. Best is to see that the reference ends at the same year as the outermost series. (This can easily be done by creating a cropped sample from the reference: use the Create sample from block button in the lower left corner on the Curve display tab in CDendro. Then select that cropped sample as your reference.) Then successively pick up (double click on) each member, check its position towards the reference and update the member's offset in the collection (right-click on the member for that setting). Finally you can create a mean value of your three samples and check towards the reference as shown below. Another way to handle a reversed segment might be to use an image editor and rotate that wrongly mounted section within the image. Or make a copy of that segment, rotate it and "mount" it in parallel with the original image. 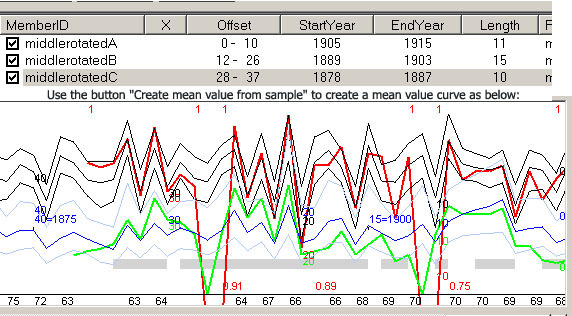 Then when measuring in CooRecorder, you use a "double point" (e.g. 21:1 and 21:2) to jump from the original path over to the next section. (You can "jump" sideways, but not much backways, so be careful how you put that rotaded segment.) This is probably the best way to handle this problem.